On October 23, 2017 at approximately 9:30 a.m., the Capital One Bank in the 6100 block of Retail Road was robbed. The suspect demanded money from the teller. No one was injured during this offense. 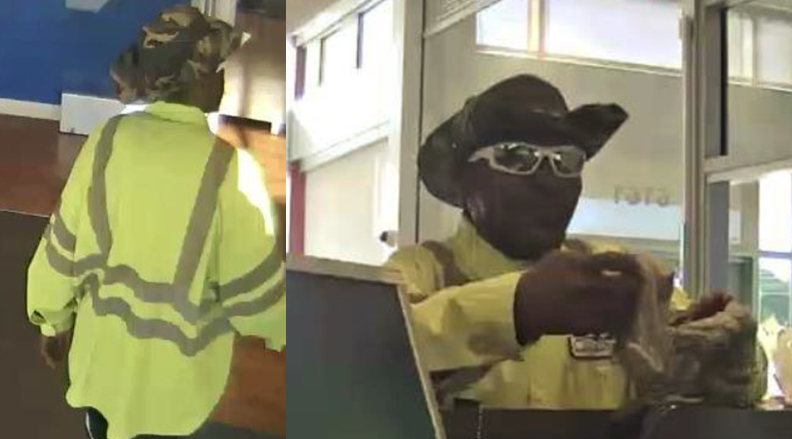 The suspect is described as a Black male in his mid 40s, 5’8” tall, 170 pounds, last seen wearing a reflective long sleeve shirt with a City of Dallas logo, black Jordan basketball shorts with a white stripe, camouflage cowboy hat and white mirrored sunglasses. This suspect may have red dye on his skin and clothing. Anyone that recognizes this suspect or has information on this offense is asked to call Detective Winn at (214) 797-0296 or the Dallas Field Office of the FBI at (972) 559-5000. If you wish to remain anonymous you may call Crime Stoppers at (214) 373-TIPS (8477).